What are you doing today that software could be doing for you? Is something on your to do list keeping your from being as effective as you can be? This is a question our brilliant COO asks our team everyday. Why? Because we want our free our people to be more human. Business is 100% about serving people, making their jobs better, making their days more enjoyable, and positively affecting those with whom we interact each day. We don’t want our team members bogged down with repetitive tasks and endless to do lists. We don’t want this for our customers either. It’s distracting and frustrating. Plus…it makes us less effective in achieving our goal to be the most irrationally helpful facilities maintenance management firm in the industry. So, we push ourselves to batch and automate as much as we can through our own software, 3rd party apps, and processes. …it’s impossible to comb through hundreds of open work orders to figure out which ones need to be worked on. So, we created a dashboard that let’s us know which work orders need our immediate attention. …it takes a ton of time to ask vendors for updates on each job, so we created a program within our proprietary work order management software that sends event driven update requests to our vendors. We can go on, but the point is these tools and tricks free us to have conversations with our customers and listen to how things can improve. We aren’t grumpy and rushed to get to the next task. Grumpy account managers are bad because people love working with happy people. Finally, we have the mental and time capacity to work on a high level emergency when it happens without letting anything else drop. We leverage technology to be more efficient and, in turn, be more human. Growing companies and departments are constantly outgrowing their processes. I have seen organizations where this is a weekly occurrence. It’s distracting and growth prohibiting. This is how we handle this at Envoy. It’s easy to overcomplicate workflows when this much change is happening. Processes are added to existing processes. It’s easier this way. It requires less effort and less thought to carry out. The problem is this does not scale because it is reactive. Instead, you should look to how the process should be revised according to what you want the future to look like. First, growth means things are getting bigger. More people. More work. More moving parts. You simply can’t afford to be reactive when you are growing. It will handcuff you and steal your time. The processes you put in place today should be able to scale for the foreseeable future. You should be able to feed additional resources into the process without having to change the process itself. Second, your processes need to be as simple as possible. Simple processes become adopted processes. The fewer non-critical moving parts the better. It’s easier to train on simple processes. It leaves room for people to be people and add human value to your business. Finally, it creates a culture of responsibility and problem solving because there are no “rules” to silo a task into the “somebody else’s job” category. As your workload increases and your processes become outdated, don’t just add new parts. Re-work the process into one that will allow you to continue to grow. How Many Steps In Your Work Order Management Process? Did you know there are over 40 steps to basic work order management? And this is just for a basic repair. Over 40! That is crazy. The reason we know this is because we mapped out the steps and every possible direction a simple work order could take. When we finished, we covered an entire white board with our notes. Our founding team knew we wanted to do things better, more efficiently, and most importantly…more effectively. 40 steps for one repair was way too much for a person to repeat over and over across thousands of work orders a year. For starters, we needed to simplify the process. Our experience told us that when you can free people to do what people do best, great things happen. In order to build our business model around high communication and irrational helpfulness, we simply could not have our Service Agents and Account Managers with their heads down doing data entry. We had to start eliminating steps. So, we started our company’s journey by building a software tool. The goal was to automate the work order management process as much as possible. My partner would repeatedly ask the brilliant question, “What are we doing that software can do?” We were drilling down the process to leave our people with nothing left to do but make decisions and communicate with our customers. We have reduced over 40 steps to just 6 decisions through our technology. This makes it possible for one Account manager to handle hundreds of weekly work orders on their own. We built-in ETA reminders to keep work orders up to date and moving forward. Our vendors set their ETA when they accept a work order and our system reminds them every 4 hours if the ETA has not been set or if they have missed it. Our IVR allows us to make sure jobs are getting repaired on time and gives us an opportunity to make sure vendors are complying with customer processes. We intentionally built-in processes to increase communication from the field by leveraging NTE’s to create a natural update points from our vendors. This allows us to tell our customers what’s going on with their repairs well before the repair is actually made. Our technology will never be a finished product. We push new updates and improvements every month based on customer and vendor feedback. It’s been exciting to see an idea through to reality. It’s even more exciting to see the impact it’s making for our customers, vendors, and employees. We keep our management costs down. We reduce the amount of time spent on repairs. We increase the amount of information we have about each repair. We improve the quality and frequency of communication, and we deliver better customized service to our customers. Envoy is obsessed with constant improvement. It’s one of the ways we are irrationally helpful. In fact, ask both our customers AND our contractors to tell us where we are failing constantly. Eventually they take us up on the offer. The result? We listen and make adjustments. Generally, we find we can answer improvement requests through implementing new features in our technology. We love to ask the question, “What are we doing that technology can do for us?” The answer to this question drives the development of our technology. Last night, we pushed an update to our application to improve 2 areas. Our customers wanted better ETA updates on work orders that required returns (i.e. quotes, return with parts, etc.). 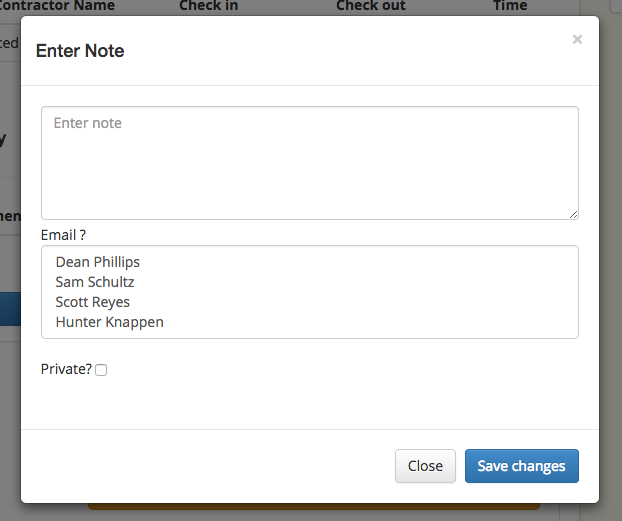 Our vendors wanted an easier way to get us updates without having to email us and create a note in our system. Now, our technology asks our vendors for updates until they provide the information we requested. This makes sure we are working jobs to a close faster. We also get the info and can update our customers accordingly. Additionally, we have improved our note functionality to act like a conduit of information without ever having to leave the app. This is on the heels of updating our Action Items panel to include all open job statuses so our vendors always know what they need to work on for us. Removing all of the busy work gives our account managers the time to do what humans were designed to do…help people. We believe so strongly about what we are doing at EnvoyFM. Leveraging the best technology with awesome, service oriented people really works. One of the questions we get often from our customers is, "How do you qualify contractors?" Our answer is simple because it's value oriented. We will only partner with companies who share our values and have commitment and capacity to execute on them. While most national facilities maintenance vendors are searching for cost and coverage area, at EnvoyFM, we are focused on our vendors soft skills. Our single most important goal is to be the most helpful facilities maintenance vendor in the business. We believe that success is defined by the level of service we bring to the people and organizations we interact with. We believe that it is our moral obligation to positively affect and influence every person (customer, vendor, and employee) that we interact with. Naturally we demand our vendors to feel the same way. In order to make it as an EnvoyFM service contractor, vendors have have an irrational commitment to communication and follow through. We ask numerous questions to get a feel if their company is led by a long-term thinking, big ideas, visionary. We ask about internal systems and roles. We ask about their goals and their plans for the future. We want to get to who is behind each and every company. What we find is that when we hire vendors who share our value of high level service, everything else works out, including cost. If you ask our customers, we perform well on that metric as well. Hey Folks! Listen, communication wins, doesn’t it. Seriously, there is not a single attribute that strengthens the level of service for a contractor than incredible, high level communication. Just ask our customers. They are happy because they are in the loop. They don’t have to chase down information. It is served to them. So, since we believe great communication elevates our industry, here are out tips to get the most from your contractors. Why is the uber-question. It cuts to the core of what so fast. If your contractor can’t tell you why, you are not getting the communication you deserve. Want even better information, ask why again. Heck, do it 5 times. We have found that 5 why’s gets you the whole truth. 2. Get the whole picture. At Envoy we preach a 4 step method to information delivery. We state what was requested. What we found. What we are going to do and why. And finally, how the job will be left when it is done. When these bases are covered, it’s easier for customers to make a decision. Our industry can bring enough stress as it is. There is no reason to add to it. We believe people like working with fun people, so we make sure every interaction with our customers is a positive one. One more thing. A funny thing happens when there is great communication in place. Costs aren't as high. It seems communication breeds honesty and helpfulness too. Want to know what this level of communication feels like? Ask our customers. They will be glad to tell you. We are, and always have been, a group of people who learn how to serve from the people we are serving. One of the ways we do this is through customer profiles. Basically, in order to train our team to serve our customers, we must first understand what our customers’ day looks like, the problems they face, and what their dream contractor looks like. This is why we are so focused on communication and helpfulness. Time after time, we hear our customers tell us it’s the best communicating and most helpful contractors who win. Next we go one step further on a customer to customer basis. We ask you who we can help you be successful. What are your goals? How are you evaluated? How can we help you hit your metrics or get your bonus or simply make your day more enjoyable? When we say we are here to help, we don’t say it in the “we are here to receive work orders from you” context. Though, we don’t complain since work orders keep us fed and living in doors. We recently found a box supplier for a customer who had that problem on his desk. What did we get out of it? We got to help. So, what does your day look like? What are you working to accomplish? What does success look like for you? Do you like the push the envelope? Are you an early adopter? The type of person who goes running in head first to try the new technology, product or service? EnvoyFM looks like every other facilities maintenance provider on the surface. Will make all of your wildest dreams come true? Well … I guess that depends on how wild your dreams are. For now, we are sticking to the facilities maintenance world. The truth is, our eyes are on the horizon. Housing starts are increasing. Dramatically? Not yet. But they are growing and staying in line with the Median projections. Why does this matter? Well, and new contraction grows, and the shortage of skilled workers continues to rise, rates will increase. It’s basic supply and demand. Handymen will answer the call of the higher paycheck. Your facilities costs will increase if you do nothing about it. So where does Envoy stand out and how is it different? We push the envelope. I have spent years managing thousands of thousands of work orders. Our team has paid close attention to which processes provide the most efficiency and which are the most cost effective. Facilities management costs are affected far greater by time spent onsite than the hourly rates you pay. So … a focus on workflow and processes are more important than simply beating contractors down on their rates. Are rates important? Absolutely. It’s just they are not the MOST important. You may already know this. The lowest hourly rate guy is not always the lowest option, right? So how do you make this trend consistent across your entire portfolio of stores. Envoy has the most effective and efficient workflow process baked into our home grown work order management technology. On top of that, we have designed an NTE process from scratch that is proven to lower average invoices and deliver consistent service across your entire portfolio. The best part is all of this is going on below the surface. We work with your call center, your team, your software. You don’t have to change a thing. We will even bring in your contractors if you like. You end up with above average communication and service at below average costs.